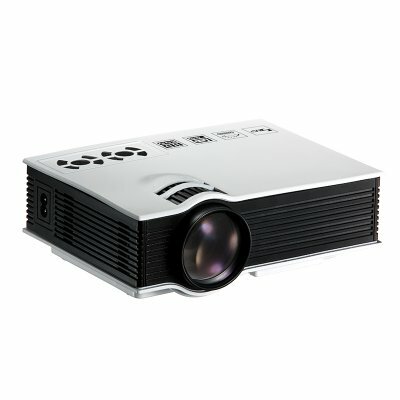 Successfully Added TFT LCD Projector - Typical 3200 Lumen, 34 To 130 Inch Projections, NAtive Resolution 800x480, AV, HDMI, VGA, USB, Micro SD Card to your Shopping Cart. Typical 3200 Lumen LED lamp provides a clear crisp image. Larger than life projection from 34 to 130 inches. Enjoy content in its native aspect ratio 16:9 & 4:3. With HDMI, AV in, VGA and more you can watch TV, movies or play games. This projector uses a 3.9 inch TFT LCD display and LED lamp for its display mechanism. With the 24wat LED lamp emitting typical 3200 Lumens and a native resolution of 800x480 you get nicely detailed projections. A 400:1 contrast ratio helps create truly dark blacks and a rich color pallet. There are ports for micro SD card, HDMI, AV, USB, and VGA inputs so you can easily connect up every kind of media player be it DVD players, Games consoles, TV box, Computer or Laptop and projector videos, games, presentations or TV shows in great quality. Capable of projecting images up to 130 inches across you have larger than life displays of all your media. With a compact design and easy set up this impressive projector is perfect for the office and would even let you set up your own home movie theater - all you need now is the popcorn. This home video projector comes with 12 months warranty, brought to you by the leader in electronic devices as well as wholesale projectors and cool gadgets..